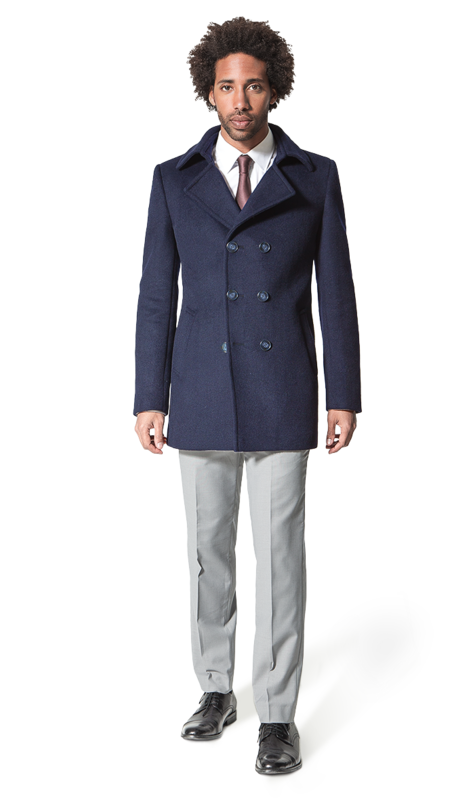 A navy blue pea coat is an important piece in men's wardrobe in winter. Choose all details and we will tailor your navy peacoat made to measure. Choose from our wool coat fabrics. Different colors and patterns for your tailored coat. Choose the details of your navy blue peacoat and personalize it with customized lining or adding a monogram. Use our pea coat online 3D designer to create the perfect winter jacket. You will be able to create a short pea coat or a long pea coat and personalise all details: you can add epaulettes to your peacoat, or elbow patches, for example. Look stunning and elegant in our men's tailored navy pea coats. The color of the classic peacoat. A unique pea coat was worn by sailors long time ago. Nowadays it is a special part of a men's wardrobe which makes you to look specially elegant. Customize your made to measure coat, a garment to protect you from cold and give a final touch to your outfits. Standard collar, classic or with lapels, pockets, fastening... hundreds of combinations to let us tailor a unique garment.